I admit it. I watch a lot of HGTV. In doing so I see a lot of do-it-yourself projects. Needless to say some turn out more successful than others. The less than fantastic projects usually flop because they project organizers do not do their homework or miss some important steps along the way. It happens. While comical for me, not funny for the homeowner. Casey Trees embraces the D-I-Y spirit. Planting trees while relatively simple can be a little intimidating. What do I plant? Where do I plant it? When do I plant it? There are an endless amount of questions that can pop up and discourage someone from planting a tree. The good news is that Casey Trees has the answers and the class to help you make you a tree planting expert. I guarantee your neighbors will marvel at your skill. 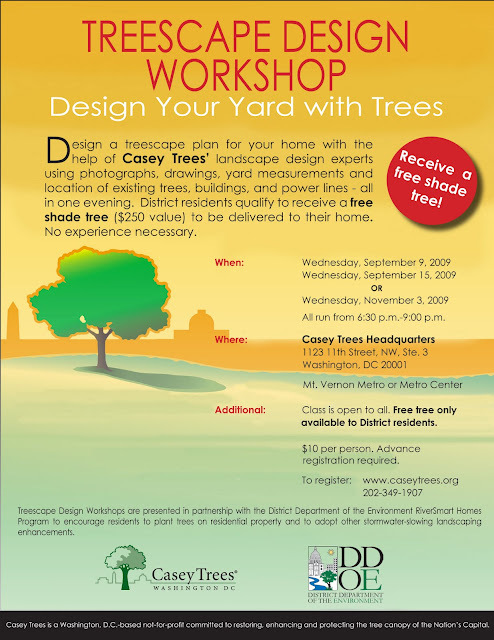 Casey Trees' Treescape Design Workshops teach DC residents about basic tree care and help them design a custom treescape plan for their yard - front, back, side, it is up to you. Participants are encouraged to bring in photos of their yard, measurements, location of existing power lines and trees to determine what type and where trees make sense based on their expressed needs. No need to get fancy. Bring your sketches on the back of a napkin or in crayon. The best news is that not only will you walk away with a treescape plan for your yard and the knowledge of how to properly care for your trees once they are in the ground but you get to pick a shade tree to be delivered to your house in the next planting season for FREE. Seeing that trees can cost several hundred dollars, you are saving some serious coin just by spending two hours with us. Plus you don't have to worry about getting the tree from the nursery to the store. I am pretty sure Metro frowns on ginkgo trees being brought on the trains. Only three Treescape Design Workshops are scheduled for this fall - 9/9, 9/15 and 11/3 - and they fill up fast. So hurry up and register today.